We gonna forget Foles didn't look good to start the season? Only the torn ACL truly worries me. He played the entire 2016 season. Big Ben has had stuff like broken ribs, noses, etc., and managed to play just fine, and I still believe this back injury is entirely something he could play through (IF he was better with a broken back than Foles, and if it didn't look like our season was over. His last game this year he actually went out playing pretty well. That game was an ugly 1st half, but then pretty money 2nd half). Don't get me wrong... Are Wentz's injuries a concern? Absolutely. Enough of a concern to give up on him? LOLOL NO. This guy was going to be the freaking MVP of the league in his 2nd season. People were drooling over his every play the same way they are doing it over Mahomes this year. You MAYBE entertain this debate if Wentz suffered a torn ACL to the same knee, or has had a career threatening injury, but not merely because he has proven to be an injury prone player. Equally as important in this "debate" (and it embarrasses me that it has become that, I only thought this would be a talking point on First Take and the like) is the other side of the coin, Foles, since cutting bait with Wentz means we are committing to Foles. Are people really comfortable with that? Do they forget 2014? 2015? Raiders game? Falcons 1st half? Falcons and Bucs game this year? You're bound to have bad games when you play as many as Foles has, I get that, but his 2015 alone makes it pretty clear to me the level of QB he is, and that's not a guy who will ever be in the upper echelon of NFL QBs. When things are going right, his supporting cast is fiting off all cylinders, the playcalling is money, and most importantly he is in rhythm, he can play great football, but so can a ton of QBs. Wentz can be an elite QB who keeps us competitive year in and year out, and you can tell me how low those odds are based on his injury history, and I'll still take that gamble. I cannot believe I have to crap on Foles, I love that man, he is one of my favorite people, period. There is just such a dramatic difference in the level between him and Wentz when you look at what they can do. I'm not even talking Wentz's obvious superior athleticism and arm, but the mind. Foles may have icey veins, but Wentz's brain clearly operates at a quicker rate than Nick's and that is everything for a QB. we gonna forget he won us the damn super bowl? It is 20M , and hell yes we should tag and trade him to Jax or Denver for a 3rd. he just beat the rams and texans i think you mean second sir. I am tempted at what the raiders could offer for Carson though. We could build a dream team around Nick. Wentz isn't going anywhere, even if the Raiders offer us all 3 1st's, plus their 2020 1st. Doug loves Wentz like Lurie loves Howie. Even if Foles wins another SB, I don't think Doug would let Howie trade Wentz. Wentz isn't going anywhere, even if the Raiders offer us all 3 1st's, plus their 2020 1st. Doug loves Wentz like Lurie loves Howie. Even of Foles wins another SB, I don't think Doug would let Howie trade Wentz. 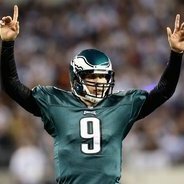 If nick foles wins the superbowl this year and that could very well happen (if some plays or calls go on our way we're probably like 13-2) I think you have to keep Nick. The Vikings are going to win and make that scenario moot. What you need to ask is what can we get for Foles, because that's the guy who won't be here in a year. I'm hoping this incoming rookie QB class looks like crap at the combine (And the Giants take one in the 1st anyways). Never happen, nor should it. It's fairly evident that this team just doesn't give a damn and thinks Carson can carry them. When he goes down, only THEN do they decide to put their big boy pants on. It's pretty abhorrent if you ask me.